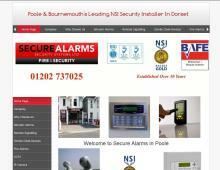 Secure Alarms is a local BAFE approved Security Company in Poole, Dorset. Intruder Alarms in Poole, Bournemouth, Christchurch, Dorset & Hampshire. Wireless Alarms in Poole, Bournemouth, Christchurch, Dorset & Hampshire. CCTV in Poole, Bournemouth, Christchurch, Dorset & Hampshire. Fire Alarms in Poole, Bournemouth, Christchurch, Dorset & Hampshire. Door Access Systems in Poole, Bournemouth, Christchurch, Dorset & Hampshire. Secure Alarms also offer Maintenance Packages on all their Security Systems.